What is Julep? : Julep started as a nail polish monthly subscription, but they have ventured into doing beauty products as well. With MyMaven, you get 3-4 products that you can swap in and out, and Maven Luxe is the same but with higher valued items and more slots! How Much is Julep? 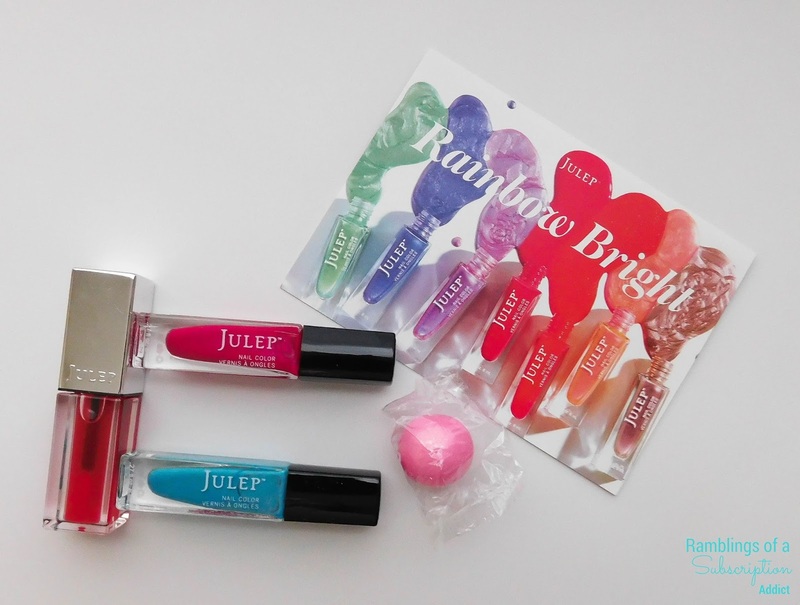 : With Julep, you have the option of choosing MyMaven or Maven Luxe. My Maven is $24.99/month and Maven Luxe is $39.99/month. The prices do lower with three-month subscriptions. There are occasionally offers for a free box with a three-month subscription, so keep an eye out for those! May's subscription brought seven new polishes in bright colors and new holographic wraps. 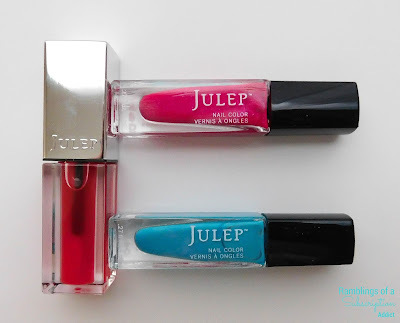 Julep also introduced Your Lip Addiction, a tinted lip oil, in three shades! I'm always interested in new lip products, so I of course had to grab one of those! They included a gumball!! Yes, it's the little things. I honestly can't remember the last time I didn't skip my Julep box, so I don't remember if the boxes had changed by then. I love the old-school look of these! Mickey - Pink geranium ghost iridescent. I really love this bright pink for Summer! There is just the slightest bit of shimmer, but it's not the easiest to pick up. Cassidy - Bondi blue crème. After the window closed, I realized I already had this polish. Whoops, it means I really need to update my collection list! Obviously, I really like this color, though, and I thought it paired perfectly with Mickey! Your Lip Addiction (Obsessed) - A healing blend of lip-loving oils formulated for weightless, wear-all-day comfort. Super shine meets zero stickiness in your new favorite nourishing lip product, boosted by a sheer tint of color. This is an oil that isn't super oily if that makes sense. It adds a nice bit of shine and moisture and a really nice shade of red! I'm not the biggest red-lover, but this is one I really like! The tint sticks around for quite some time, so this bottle will last a while! Overall I really liked my box from Julep for May! The June box window has already ended (which shows how behind I am), so I'm curious to see what the July one brings! Make sure you are following me on Instagram to see what manicure(s) I come up with!